The Embassy is one of the 22 theaters in my new book “After the Final Curtain: The Fall of the American Movie Theater.” Find out more here. 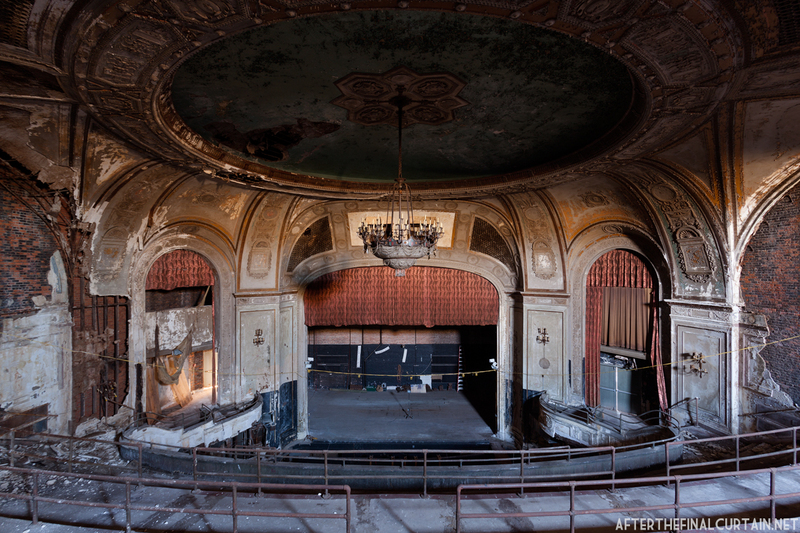 The Embassy Theatre opened August 12, 1926 in Port Chester, NY. 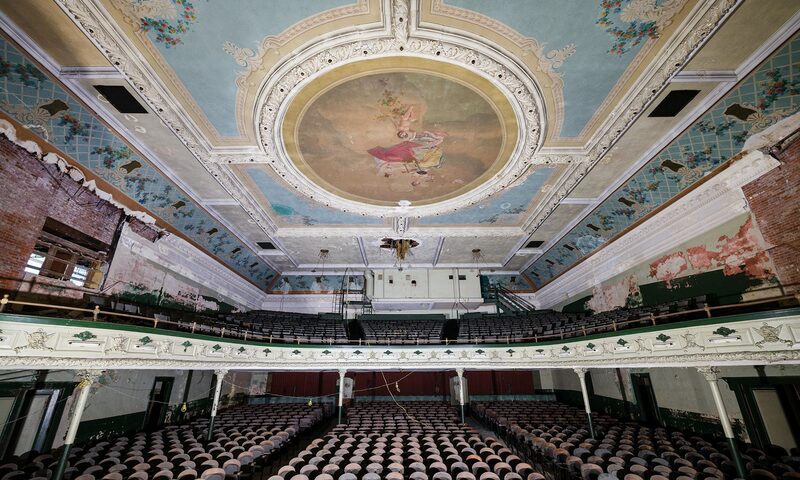 Designed by prominent theater architect Thomas W. Lamb, the 1,591 seat theater was built on the grounds of an old Elk Lodge. Lamb also designed the nearby Capitol Theatre, which opened just a few days after the Embassy. View of the ceiling from the main level. 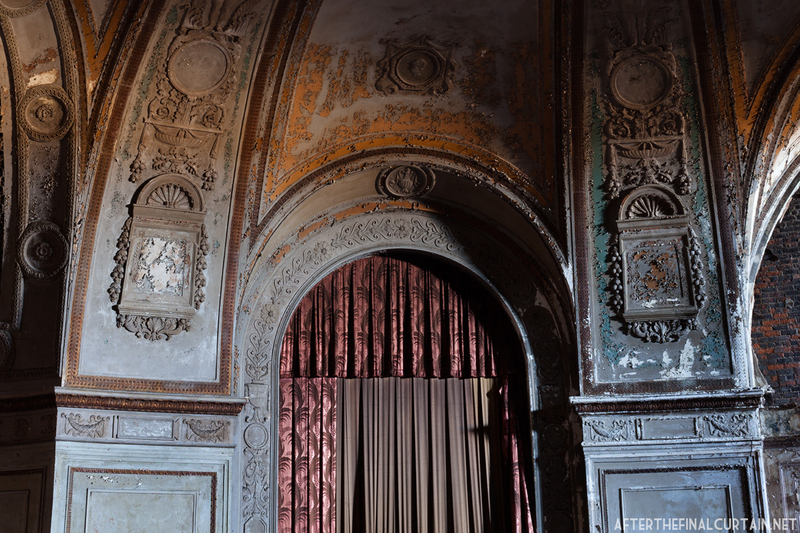 Like most theaters of its time, the Embassy opened as a vaudeville house and gradually began pairing live performances with silent films before switching over to motion pictures. It was also used to host different events, including bridal showers and fashion shows. 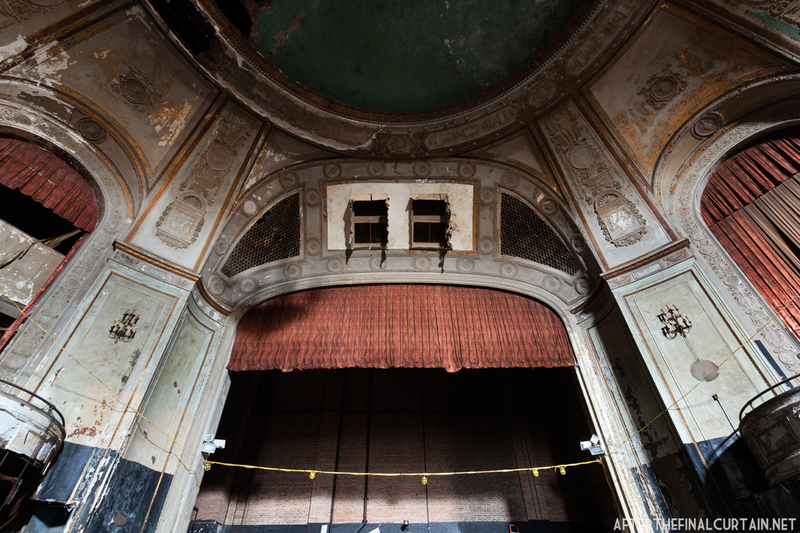 In August of 1937, the theater was added to the Leventhal-Werba Atlantic Coast circuit and was used as a live play house. The Embassy eventually switched back to showing motion pictures. 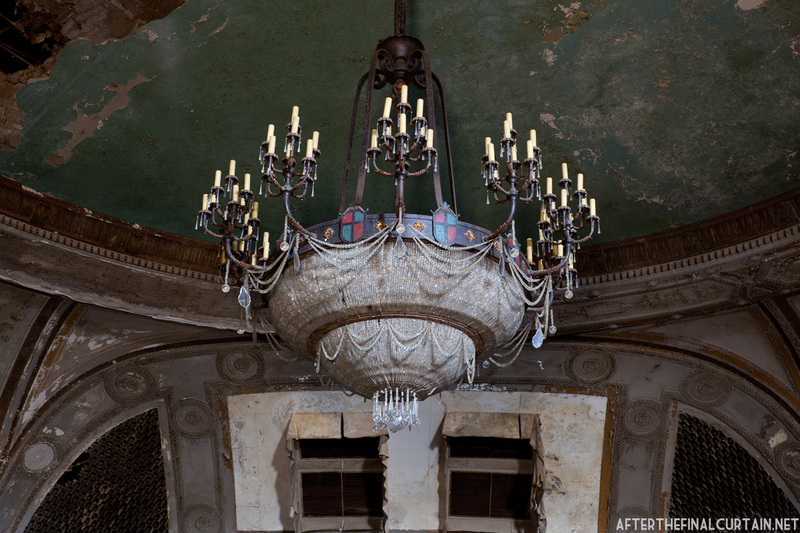 The original chandelier still hangs in the auditorium. The Embassy closed in the early 1980s after showing Spanish language films for a few years. On June 26, 1986, the theater was reopened as a dance club for teenagers called the Public Domain. It was shut down by the police after only one night due to noise complaints. The theater almost became a multiplex in 1998, but the deal fell through. 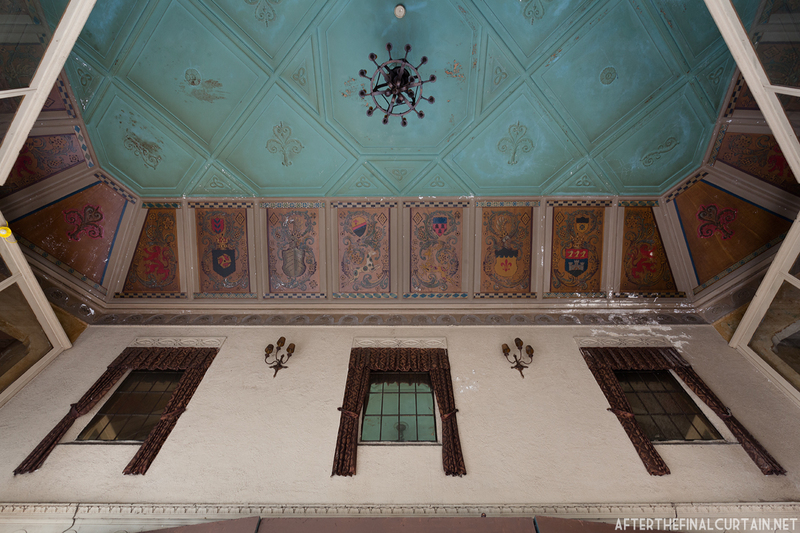 The ceiling of the lobby was decorated with various coats of arms. 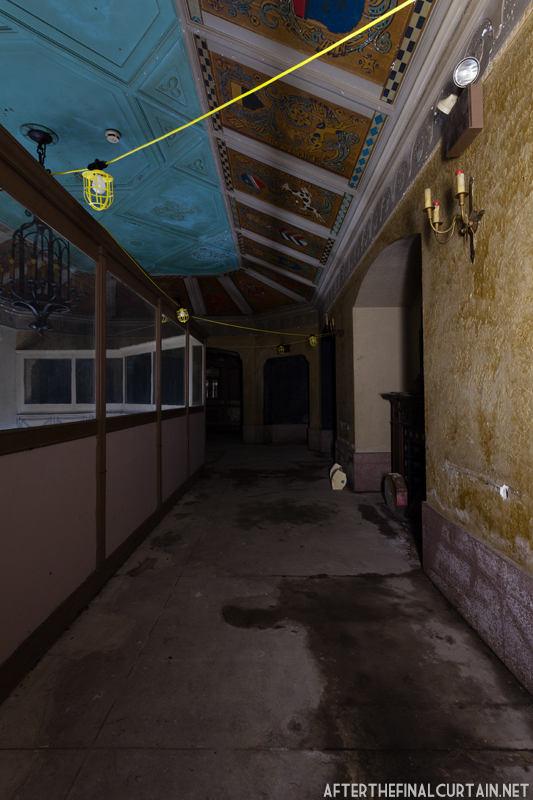 The Port Chester Council of the Arts tried to get the Embassy listed on the National Registry of Historic Places and to renovate the theater for use as vaudeville museum. They cleaned up and repainted the Embassy, but were unsuccessful at obtaining the funds to restore the building. The building was gutted in the spring of 2017. 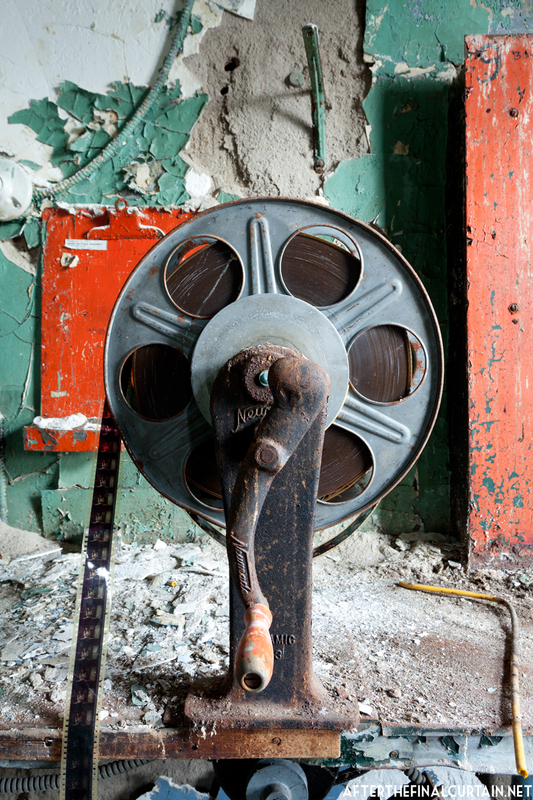 Most of the projection equipment was left behind after the theater closed. A close up of some of the plaster-work to the right of the stage. 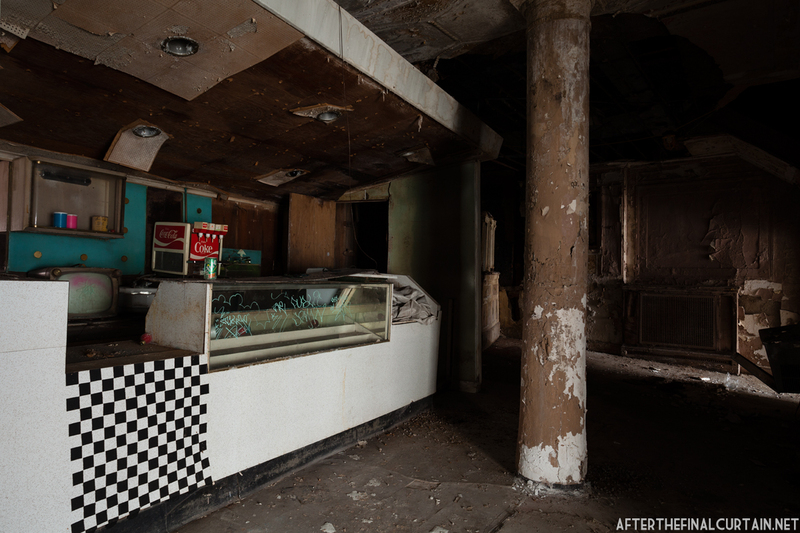 The snack bar was added years after the theater opened. 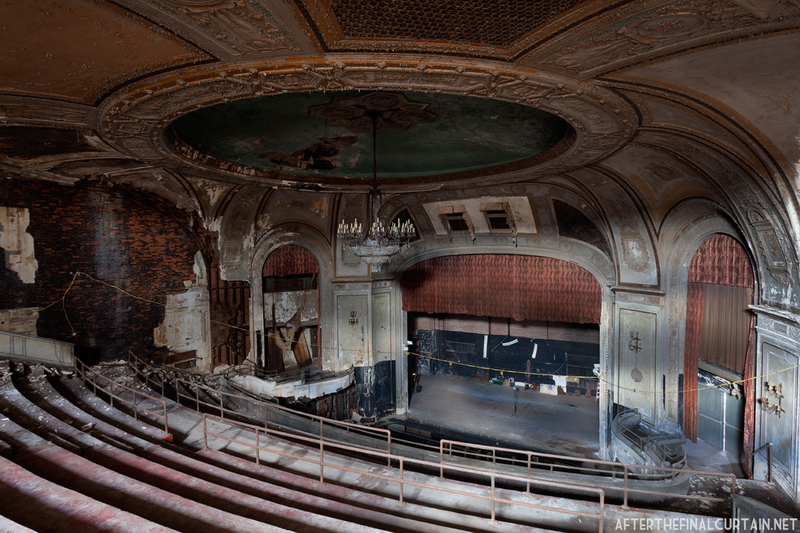 View of the auditorium from the box seats. 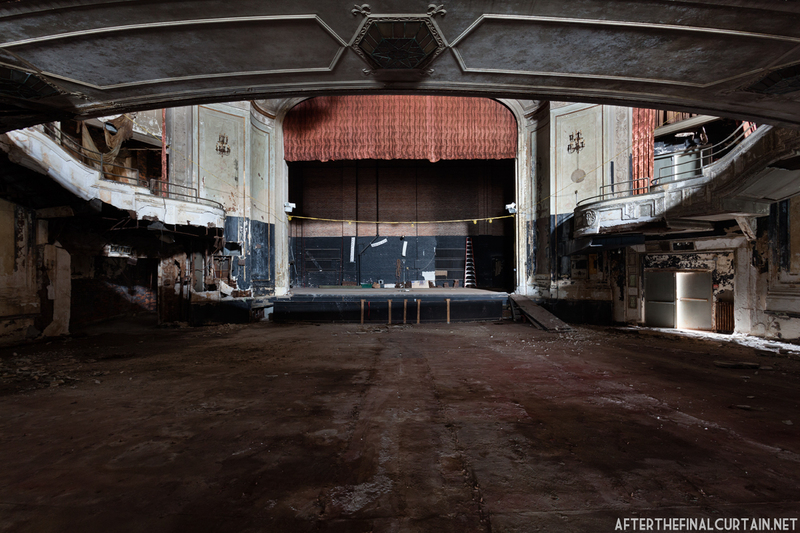 The proscenium has two large holes in it due to the removal of sound or lighting equipment after the theater closed. A closer look at one of the projectors. 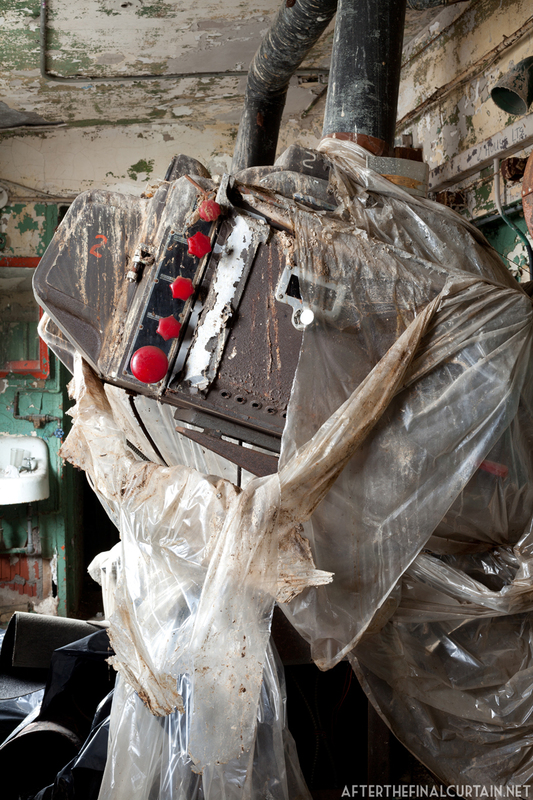 The hand cranked film rewinder still has one of the last movies to be shown at the theater in it. This one is one of the best ones you’ve visited, in my opinion. So beautiful. Are you aware if the curtains from the stage and box seats are original. It looks great. Chandelier (which seems very bizarre but beautiful) and the film equipment still being there is very cool. I think he should offer field trips for fans to go along with him! Something like that may happen in the near future. Keep an eye out for the announcement. As a child, over 55 years ago, I remember attending and watching first run movies for 25 cents. The Capitol was 30 cents. Me, too. And you could stay all day, right? There would be 2 films usually, I think. I spent many hours at the Embassy Theater. Mr Hood was the manager back then. 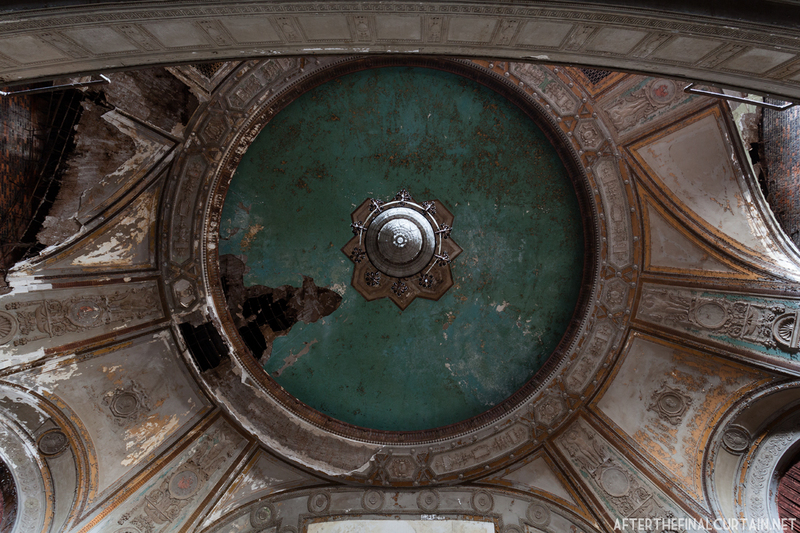 I hope they can restore it back to it’s original beauty. Good memories from the Embassy Theater. Went to the Embassy back in the early 40’s I remember going by myself around 1950 and paid 9 cents for admission. My 2 brothers and I went to the Capitol theater more frequently than the Embassy. 2 full feature films, 20 cartoons, Movietone News, and coming attractions were the norm. Admission was 25 cents. After the movie, we would go to Texas Lunch or Nick the Greek and have a chili dog for a quarter. Did you sell off all the things of interest? I am not in the film industry, but a few posters or vaudeville show Announcements would be interesting since I was born and raised in Port Chester. What are you doing with the place? A diner theatre would be cool; I love the old theatres and achetecture. I don’t own the theater and have no idea what happened to the items that were left behind. My wife and I saw Pippin on Broadway back in 1972. Irene Ryan (Granny on the Beverly Hillbillies) played a part. We went to dinner with John Rubinstein and Irene. She asked where we were from and we told her Port Chester, New York. She said “My husband and I played Port Chester at the Embassy Theater back in the vaudeville days!” What a great memory! Seeing these pictures made me cry. 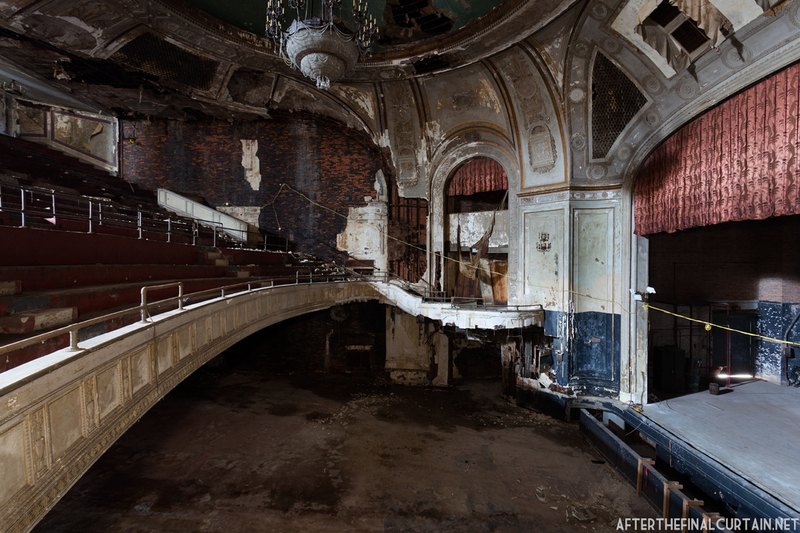 Such a sad ‘death of a theater’. Cannot compare to the tin cans of today. What organ did it have and where did it end up? 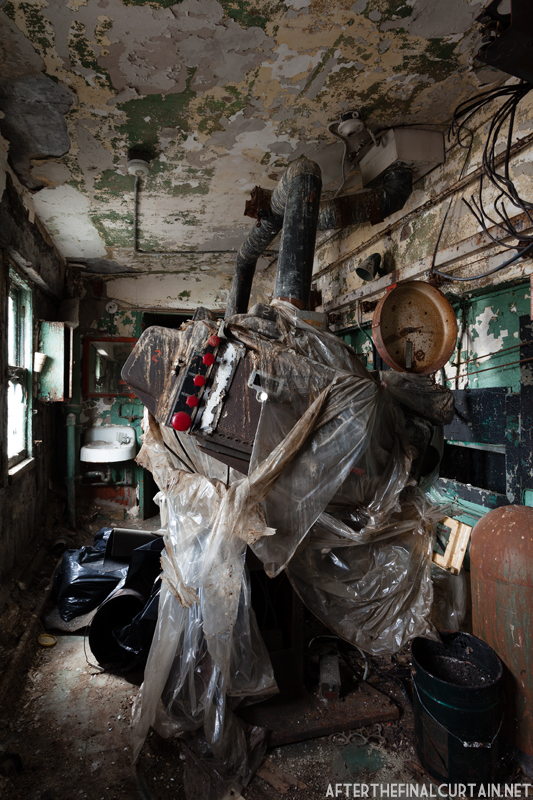 It had a 2-8 Marr and Colton organ, but I don’t know where it ended up. I also grew up in Port Chester, growing up in PC was magical. Going to the Embassy Theatre and meeting up with friends on the weekend is something that most people remember. So glad to know that we all share wonderful memories of this town. This is very rare to find these days.